This wonderful song about old memories – springtime experiences yellowed, like the falling leaf, with the passage of time – bristles with new musical procedures. It is surely one of the most potent indications of how Schubert’s songwriting might have developed had he been granted a longer span. What is particularly thrilling is how the composer combines the age-old form of the strophic song with music that is in the new Schubert style of the Schwanengesang – economical and lean, yet full of the most powerful and condensed expression. Another 12/8 dramatic song comes to mind, Die junge Nonne of 1825, but how portentous and somewhat old-fashioned is that beloved but lumbering accompaniment when compared to this! In Herbst the piano staves seem as thinly foliated as trees on a bleak and blustery autumn day – another strophe and one feels that all the remaining semiquavers would be blown away to silence. Everything here is for the maximum effect with the minimum amount of pianistic fuss; and this frees the vocal line to range across the stave in long arcs of astonishingly eloquent expression, all the more surprising in that we hear the same music three times without tiring of it in the least. The autumn winds are set in motion by oscillating semiquavers in minor thirds in the piano’s right hand. This murmuring sound is the only thing we hear for five quavers – this bare shaking brings the chill of foreboding into the music. And then quavers on adjacent tones and semitones (an E minor scale beginning on the leading note) insinuate themselves into the bass clef. In counterpoint with the wind this motif creeps into the body of the song like an icy feeling that grips and seizes the heart without warning. This unfurling figure rises to a dotted crotchet on C, the sixth degree of the E minor scale, before it changes direction and takes a bar to fall to an A at the bottom of the bass stave. (One of the intervals in this descent is a major third, but only a Schubert could have known how to make a tiny adjustment that changes a commonplace scale into a unique and memorable melody – we are reminded that Beethoven also had an uncanny way of investing banal musical formulae with unforgettable magic.) Once this left-hand scale has bottomed out on that low A the right-hand harmonies change on the second beat of the bar: the thirds that make up the tremolo (E and G) slither up to F natural and A, and the result is a first inversion of the flattened supertonic, a sidestep into all the desolation of autumn. 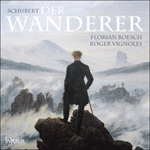 In this way Schubert achieves an effect both windswept and barren. This low left-hand A lasts three beats before rising to A sharp and then the dotted semibreve B over which the music briefly moves into the dominant before a return to E minor and the entry of the voice. The singer’s melody is a strong and purposeful one with a touch of dramatic rhetoric. The pianist’s right hand continues its oscillations throughout while the main musical conversation takes place between the singer and the piano’s bass line. The effect of a serious colloquy is heightened by the suggestion of a canon – the second bar of the vocal phrase remains on a fixed note as the bass line echoes and answers the first. (Here the music seems prophetic of another great autumn song, Fauré’s Automne with its plunging octave basses.) Once again we note the creation of ‘multum in parvo’: the melody of ‘Es rauschen die Winde / So herbstlich und kalt’ is nothing more than an E minor arpeggio moving down, and then up, the stave, and the following phrase (‘Verödet die Fluren / Entblättert der Wald’) is a D minor sequence of this sturdy, but hardly original, idea. No matter, the effect is magical, and typical of a number of similar sequences in the Rellstab songs of Schwanengesang. What follows is much more unusual; indeed Johannes Brahms could have incorporated the following bars into his songs without our noticing the intrusion. It is not only that the music achieves a windswept melancholy that is both bleak and towering in a way that suggests the late romantics; the musical procedures are new as far as Schubert is concerned. The dislocations of the syncopated vocal line in the middle of a word (‘Ihr blumigen Auen’ and ‘du sonniges Grün’ in the first verse) are to be found nowhere else in Schubert’s songs. This mournful melisma, somewhere between a wail and a sob, exhales the heavy and dolorous romanticism unknown to the musicians of Schubert’s epoch – in comparison the harrowing lacerations of Winterreise seem grounded in the Classics. The vocal line beginning in the woeful regions of the submediant seems to be drawn downwards by the weight of its distress and the inner-voice harmonies of the accompanying semiquavers rise against it in contrary motion, each beat registering a subtle change of harmony. It is this grinding clash of harmonies and rhythms, metaphors for the deepest engagement of feeling, which prophesies Brahms. Note the heavy bank of left-hand crotchets and quavers which ascend the stave before ‘ihr sonniges Grün’. (It is now the piano’s turn to lead in the overlapping exchanges between voice and accompaniment.) In the previous phrase the left hand had settled on a C major chord (under ‘blumigen’), but now (under ‘sonniges’) the same harmony is ‘decorated’ (hardly the appropriate word for so sad an effect) by a magnificent accented passing note in the left hand (a dotted crotchet B leaning on the C which resolves it). This emphasises, in a Brahmsian way, the pain of bidding farewell to life’s green summer. It is little wonder that Brahms himself went to the trouble to copy out this song when he saw the autograph shortly after its re-discovery; his own style was fully formed by the time Herbst came to light, but he must have immediately realised that this song made his own debt to Schubert all the clearer. It is also worth noting that Brahms had written a Herbstgefühl in 1867 to a poem by Adolf von Schack which has a similar (though less agitated) autumnal mood and is much influenced by Schubert. That song ends with a quotation from Der Doppelgänger. Schubert uses two of Rellstab’s strophes for each musical verse. He has moved rather swiftly through the first six lines of poetry, but uses the words ‘So welken die Blüten / Des Lebens dahin’ twice in order to bring the musical verse to a conclusion. This occasions a vocal line of the broadest sweep, imposing and melancholic, and ringing with the flattened harmonies (the chord of F major makes a wonderfully mournful impression in the context of the key of E minor) with which Schubert casts a pall over this seasonal depiction. Note the sad downward movement of the scale for the withering of ‘welken’ and the sudden, desperate leap upwards for ‘dahin’. This last word is supported by a dotted semibreve pedal on C which underpins four different right-hand harmonies in the course of a bar – a metaphor for the changing and restless nature of time. But this is only the first appearance of these words. Their repeat occasions something even more frighteningly intense: the addition of a B flat in the second ‘welken’ further darkens the mood and the final ‘Blüten’ is set to a rising octave on an F minor chord which seems to stretch out in vain in an effort to touch the past. The doleful mordent on ‘Lebens dahin’ twists the concluding cadence into bitter expressiveness. This is reminiscent of the written-out turn with which Der Doppelgänger comes to a conclusion with words (‘in alter Zeit’) which also emphasise the ravages of time. The song’s extraordinary prelude serves as an interlude between the verses. (Little changed, it will also serve as a coda.) One can only marvel at the genius of Schubert when it comes to strophic songs. His very best examples somehow manage to allow the music to be equally expressive, and equally appropriate, for each of the poet’s verses. There has been much speculation why this song was not included as part of the Schwanengesang, and why it languished in obscurity in Heinrich Panofka’s album rather than as a song-jewel to be sung by everyone. It could have been mere chance, perhaps, but the tiny flaw in the word-setting of Herbst might have been the cause of its suppression. My guess would be that after a magnificent opening strophe Schubert was less than happy with how Rellstab’s words fitted the remaining two. From the point of view of musical mood there is no problem at all, and a fine performer can gloss over any rough corners (as he often must do in terms of the relative weight and length of unimportant words in Brahms’s songs). But there are one or two details which would have struck Schubert as unacceptably imperfect in this year of matchless creations. The phrase ‘Ach, wie die Gestirne’ contains a long expressive melsima on the word ‘wie’, and in the third verse a similarly unlikely emphasis of the non-crucial word ‘über’. At the beginning of the poet’s sixth verse (in the third musical strophe of the song) the enjambment of the two lines ‘Kalt über den Hügel / Rauscht, Winde, dahin’ makes for a long (and unbridgeable) gap between ‘Hügel’ and ‘Rauscht’ and an uncomfortably snatched ‘Rauscht’. (The wail of ‘Winde’ is, however, a perfect expressive fit.) Now this is the sort of imperfection that Brahms (much to the exasperation of people like Hugo Wolf) sometimes allowed into his word-setting, but we do not find such awkwardness in the greater songs of Schubert’s maturity. The first verse is so perfect in every respect, however, that the song did not deserve to be suppressed completely, or destroyed. The song’s similarities to Aufenthalt from Schwanengesang may be another factor in its suppression. 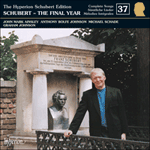 Schubert may simply have felt that Herbst was a study for the later song, and that it was impossible for both works to appear in the same group or cycle. In any case, Herbst was ‘lost’ for many years in an autograph album belonging to Heinrich Panofka (1807-1887). He was a cosmopolitan figure who was a violinist, singing teacher, music teacher and critic. He was born in Breslau but spent much of his life in France and Italy. A friend of the poet Hoffmann von Fallersleben, Panofka met Schubert in 1827, and he must have made something of an impression on Schubert for the composer to have written an entirely original song in his autograph album, adding the words ‘Zur freundlichen Erinnerung’. 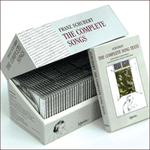 It is the only copy of the work in existence and was unknown to Friedländer when he prepared his Schubert edition for Peters. The songs was unearthed just in time to appear in the very last volume of the old Mandyczewski Gesamtausgabe in 1895. Panofka went on to write a significant appreciation of Schubert’s work in the Revue et gazette musicale in 1838. This had a crucial effect on Schubert reception in France as it was from about this time that the early mélodie composers (also impressed by performances by the tenor Adolphe Nourrit) began to take notice of Schubert’s songs. my beloved to my heart. Herbst, though to a text by Rellstab, did not appear in Schwanengesang, and the manuscript was not discovered until the 1890s. It was actually Schubert’s first setting of the poet, composed in April 1828 and dedicated to Heinrich Panufka, a young violinist, singing teacher and music critic whom Schubert had met the previous year. A highly atmospheric nature-piece, its texture anticipates Mendelssohn’s songs on a similar theme, with its tremolando right hand and sinuous, fateful left-hand melody. It also derives a special harmonic colouring from the first two lines of each verse, which are identical in melody, but heard first in D minor and then immediately a tone lower in C minor. Herbst, ne parut pas dans le Schwanengesang, son manuscrit ayant été découvert seulement dans les années 1890. Exprimant pour la première fois en musique des vers de Rellstab, Schubert composa ce lied en avril 1828 et le dédia à Heinrich Panufka, jeune violoniste, professeur et critique musical qu’il avait rencontré l’année passée. La texture de cette pièce très évocatrice sur la nature anticipe les lieder mendelssohniens sur le même thème avec, à la main droite, un tremolando et, à la gauche, une sinueuse mélodie fatidique. Les deux premiers vers de chaque strophe lui confèrent, en outre, une couleur harmonique particulière en présentant la même mélodie mais jouée d’abord en ré mineur puis, derechef, un ton plus bas, en ut mineur. Herbst, von Rellstab, erschien nicht in Schwanengesang, und die Handschrift wurde erst in den 1890er Jahren entdeckt. Tatsächlich war dies Schuberts erste Vertonung dieses Dichters, die er im April 1828 komponierte und Heinrich Panufka, einem jungen Geiger, Gesangslehrer und Musikkritiker widmete, den er im Jahr zuvor getroffen hatte. Dieses äußerst atmosphärische Naturlied antizipiert mit dem Tremolando der rechten Hand und der sich windenden, schicksalsträchtigen Melodie in der linken die Textur von Mendelssohns Liedern über ein ähnliches Thema. Es erhält auch durch die ersten beiden Zeilen jeder Strophe, deren Melodie zwar identisch, aber zuerst in d-Moll, dann sofort einen Ton tiefer in c-Moll zu hören ist, eine besondere harmonische Färbung. 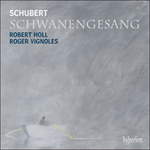 No one knows why Schubert omitted the bleak, windswept Herbst (April 1828) from his collection of Rellstab songs, eventually published posthumously in the Schwanengesang anthology. It yields to few late Schubert songs in its evocation of atmosphere—you can almost feel the chill gusts stripping the sparsely foliated trees—and the mingled strength and pathos of its melody, intensified by the yearning ‘Neapolitan’ harmonies at the end of each verse. It comes as no surprise to learn that Brahms was a particular admirer of this haunting song. Personne ne sait pourquoi Schubert omit de faire figurer Herbst (avril 1828), œuvre austère et fouettée par les vents, parmi les Rellstab-Lieder publiés posthumement dans l’anthologie Schwanengesang. Rares sont les lieder schubertiens tardifs devant lesquels ce lied s’incline en son évocation de l’atmosphère—on sent presque les bourrasques glaciales dépouiller les arbres aux feuillages chétifs—comme en sa vigueur mélodique mêlée de pathos et exaltée par les harmonies «napolitaines» languissantes, à la fin de chaque strophe. Rien d’étonnant à ce que Brahms admirât particulièrement ce lied taraudant. Es ist nicht bekannt, weshalb Schubert den trostlosen, windumtosten Herbst (April 1828) aus der Sammlung von Rellstab-Liedern ausließ, die posthum im Schwanengesang veröffentlicht wurden. Nur wenige späte Schubert-Lieder kommen diesem Werk in der Erzeugung der Atmosphäre gleich—man kann die kalten Böen, die die kaum belaubten Bäume entblättern, förmlich spüren. Ebenso eindrucksvoll ist die Kombination von Stärke und Pathos in der Melodie, die durch die sehnsüchtigen „neapolitanischen“ Harmonien jeweils am Ende der Strophen intensiviert wird. Es ist nicht weiter überraschend, dass Brahms dieses eindringliche Lied besonders bewunderte.